Imperfectly Painted: Yuck! I HATE this color! I am sure I'm not the only one to have that reaction to a nail polish color. As much as we all love nail polish we have to admit we have come across colors that we hate and kick ourselves for buying. This is how feel about a particular color. Now, before I get into it this is my personal opinion on this color. You may love this color and it may look good on you, but for me it doesn't work out. 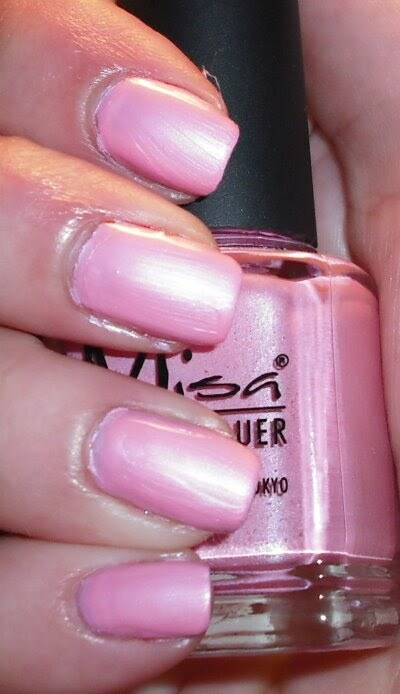 The color I'm talking about is Misa Fleeting Hibiscus. I have 2 reasons for buying this one of them being a petty reason the other being what I thought was a valid reason. The petty reason is I love hibiscus flowers, so I was drawn to the name. The valid reason is I saw a swatch of this somewhere else and it looked way different than what I came up with! Fleeting Hibiscus can best be described as crushed up chalky Pepto Bismol stomach tablets that is mixed in with the poop from a bird who swallowed frosty eye shadow from my wacky aunt who likes to wear overly happy Christmas tree nail stickers on her nails. I'm very susceptible to the power of suggestion or I'm just a hypochondriac. I see something that reminds me of Pepto Bismol and it makes me nauseous. My mom used to shove that stuff down my throat when I was sick saying it would make me feel better, but it never did it just made me throw up. Suffice it, i to say Pepto Bismol colors literally make me queasy because of what they remind me of :P.
Is there a color you absolutely hate? What color is it? EW, I think this is really ugly as well. I really disliked all brown or taupe polishes, and olive green ones. RBL No More War is HIDEOUS. Actually I think it's lovely :) I really hate all browns. Yuck. hehe, Crushed-up Pepto tablets, that is such an apt description! I wish I could say I think it looks good on you, but yeah, I agree with you, kinda does nothing for your pale skin. I felt that way about $OPI Leaf Him at the Altar...I quickly found a new home for that one! @Heather--totally agree with you, RBL No More War is seriously gross and now that they are re-releasing it I think we are gonna see a whole lot of swatches! I agree, not for you! or me either. I just posted three colors I hated in a recent blog post. One of them made me feel like a mean old lady. They were all frosty browns. Blech. I actually really like it, I hate green nails on myself though.. they make me look WEIRD! Helena- I'm glad you like it! I don't care for most browns, but I do like darker brown shimmers. April- I LOVED your post that frosty brown. Your Vegas old lady description was spot on! jade- I'm glad you like it. I knew there would people out there who did. I have a difficult time with greens too. They always make my hands look weird unless they are dark greens. Lacquerware- Pepto is nasty. Blech. Browns are not my favorite, in polish or clothing...but every once in a while you find one that looks great on you. CND Cuppa Joe is fabulous and Misa Chocolate Icing is pretty awesome too (that one has a lot of red shimmer). I forgot, my most hated? China Glaze Atelier Tulle. I ordered it expecting a slightly warm pink and got salmon flavored cat food. Yuck.